At first, there were a handful. 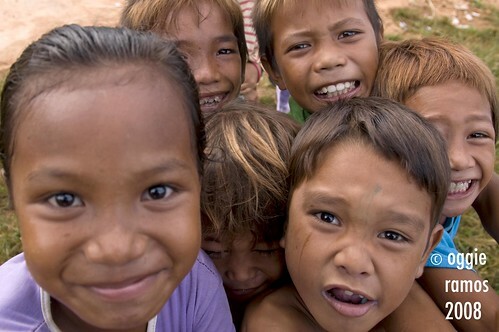 the next moment, a throng -- kids of varying ages milled around me for a picture even before I reached the stilt village of the Bajaus in Bongao. It's mid-morning and the village looked like kidsville as most adults were in the marketplace or have gone fishing. The stilt alleys are abuzz with more kids, all eager to smile at their guests as we pass by. It sets me into thinking it must be amazing to spend one's childhood in a neighborhood suspended above the water. Then again, the Bajaus have a heritage associated with the water, a seafaring and nomadic history that dates back to a time when they would live in boathouses called lepa. Weaving our way through the main street, a kind old lady offered us her colorful banigs (straw mats) for 300 pesos. 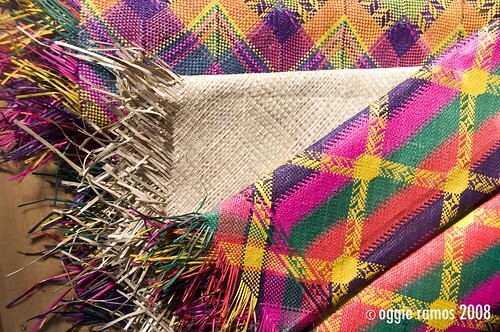 The colorful pieces and intricate weaves caught my eye; after all, the bajaus are really known for their weaving tradition. But I held off buying until we came to the end of the strip where we met with the village coordinator, Benita Joe. It was a good thing as she was selling her small banigs for just 200 pesos each. I would've love to buy the king-size mats if i had more money with me as i still sleep on the floor to this day. But bringing it home is also another tricky matter so no go. Heading back home, we waded through more happily-noisy kids. We may not understand each other's words but i guess a smile is enough to share and to know that we're brothers and sisters after all. Info: Bajau mats are more than just eye-candies; buying them also helps support the weaving tradition of the bajaus and provides them extra livelihood. mats with specified designs have to be ordered at least 3-5 days in advance. prices vary from P200 for small banigs suitable for framing to upwards of P1,500 for king-sized ones. contact Benita Joe, the Bajau village coordinator, at 0919.3905965. Are the bajaus a disappearing minority group now or are they still flourishing, living the way their ancestors did in the past? love those banigs very colorful. i guess you can even use them as wall decors. bert, from what i read and heard, the bajaus are flourishing but their seafaring has been limited. 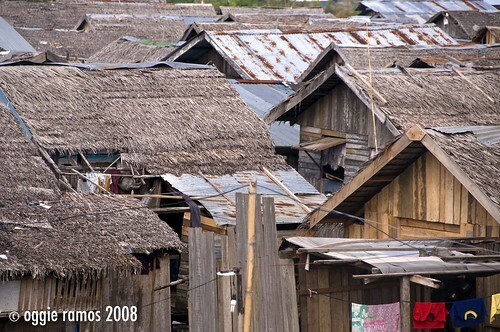 most bajaus are settled on stilt houses and others have settled on dry land. photocache, there are small sizes, in fact, for framing. i can only afford the small ones and the king/queen-sized ones are tricky to bring back home so i have several small ones for framing. i can relate with your experience with the kids. that is likely to happen to me too. isang bata lang ang kinukunan ko, mga ilang minuto pa...super dami na nila. di ko na mapagkasya sa frame. hehehe. i used to help my family (my mum's side) in weaving mats/banig. well, it's more of watching than helping really but i tried learning it. they are not as colorful as the Badjau's mats but i know that before you finish one, it's quite tedious. Looks like the kids like you ! rayts,nakakatuwa naman itong mga kids so it's really a blast interacting with them. you weave pala? galing naman. weavers amaze me with their skill and of course, patience. can you share how you got there and where did you stay? i'm planning a trip but details are limited.